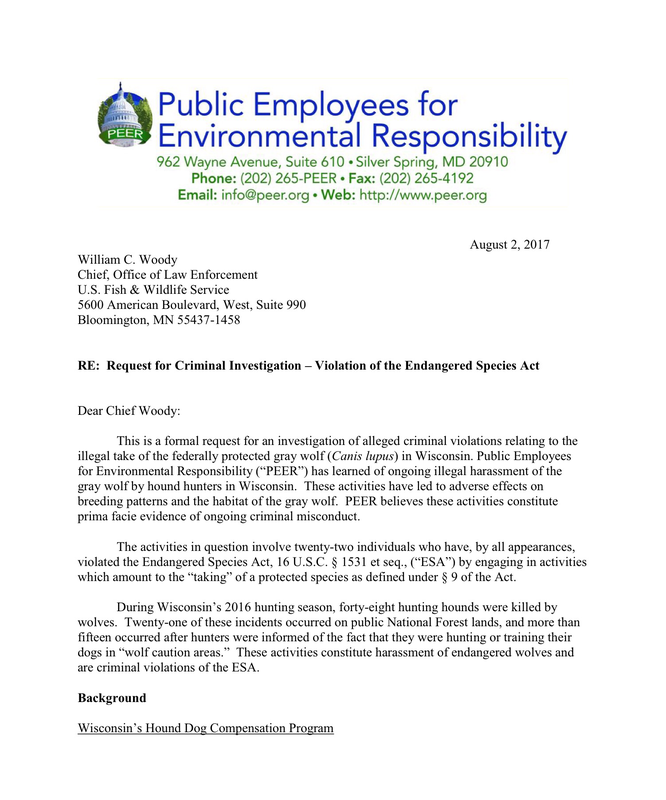 Washington, DC — Hunters unleashing packs of dogs to tree bears in Wisconsin woods are criminally harassing gray wolves in violation of the Endangered Species Act, according to a complaint filed today by Public Employees for Environmental Responsibility (PEER). The complaint cites state payments to hunters to compensate for hunting dogs killed or injured in clashes with wolves as evidence of violations. During Wisconsin’s 2016 hunting season, forty-eight hounds were killed by wolves and more than fifteen of these cases occurred after hunters were informed that they were hunting in “wolf caution areas” where wolf depredations had occurred. Wisconsin also allows for training dogs to pursue bears from July 1st through August 31st – the period when female wolves are tending to their pups and are more aggressive about defending their young and their territory. Wisconsin is also the only state with a program that compensates the owners of dogs killed by wolves while hunting other animals. Under the program, the Wisconsin Department of Natural Resources (DNR) pays each hunter $2,500 per hound killed during a wolf depredation event. In 2017 alone, the state paid out $99,400 to hunters for hounds killed by wolves. Gray wolves are classified as an endangered species in the Great Lakes region. Under the federal Endangered Species Act, criminal “take” does not require proving that the hunter intended to hurt a wolf. Take can occur when a hunter mistakenly shoots an endangered species believed to be a non-listed animal. Criminal take can also occur when a hunter’s activities, though not specifically directed at a listed species, result in take of a listed species, as appears to be the case here. Compounding the conflicts is the fact that bear hunting with hounds (“hounding”) is basically unregulated in Wisconsin, despite it being a banned hunting practice in 32 states. In 2015, the state eliminated the bear hound training licenses previously required. Both residents and non-residents may now participate in bear baiting, hunting, and training without a license. The PEER complaint asks the U.S. Fish & Wildlife Service to open criminal investigations of twenty-two individuals who engaged in hounding during the 2016 season in the Chequamegon-Nicolet National Forest or on DNR-managed land and who also received wolf-related compensation for damage or loss of hounds from the state. If the agency determines that criminal take took place, PEER asks that the cases be referred to the U.S. Justice Department for prosecution. We’ve been working with PEER to make this happen & providing background information on this issue, and we were copied in on this press release. We are sharing this breaking news story with you. Wisconsin Public Radio will have a full news story out on this criminal Complaint. $2500/hound seems pretty high. But it’s a nice sum for hunters too stupid or greedy to protect their dogs. Shame on these hunters.